This story on the men’s rights movement in the latest issue of Mother Jones deserves a read. This is the best kind of reporting on a fringe group that, if it is not a hate movement in the strictest definition, is pretty close to crossing the line. It’s thorough and dispassionate. It even draws the reader into the shreds of truth about male insecurity in contemporary America that inspired Warren Farrell’s earlier work on gender, in a way that only ends up emphasizing how off-base his movement is. For example, male social standing in America is indeed tied to earnings ability, which is one of Farrell’s favorite points. But the dominant ideas about what makes a good man–a breadwinner who performs tasks that rely on physical strength and toughness to bring home the bacon–are out of sync with economic realities. In some cases, this work has been replaced by hand-softening office jobs. 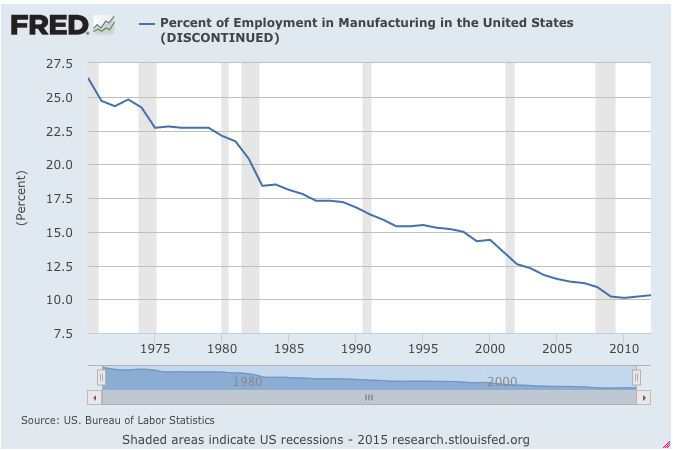 In many others, the work hasn’t been replaced at all, as American manufacturing jobs have evaporated over the last decades. In the vacuum, men have clung to vestiges and artifacts of a time when economic and social realities were more in line with valued models of masculinity. 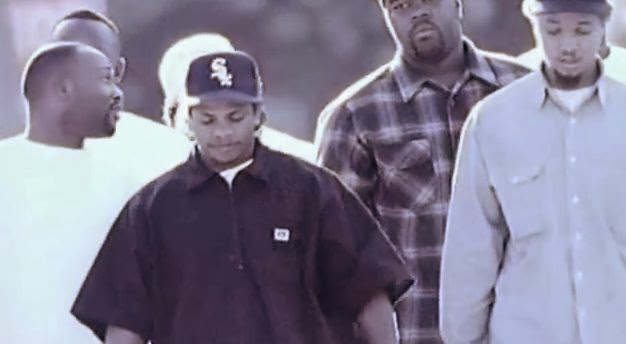 This makes me think of hyper-masculine rhymers N.W.A. 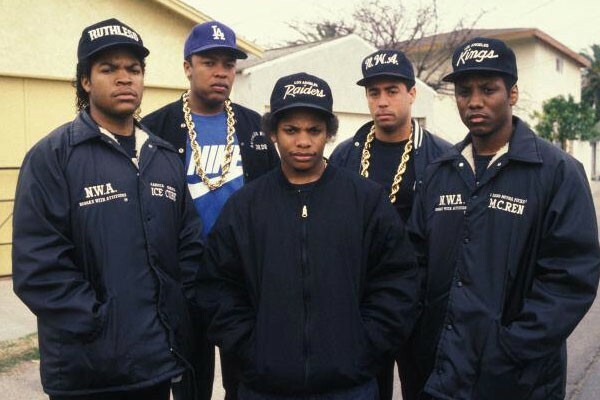 (and the 1980s L.A. gangsters they emulated), who frequently dressed as if out for a shift at the local steel mill (accessorized with a couple of gold chains). Such manufacturing jobs–which had provided lots of employment for working-class communities in Los Angeles and elsewhere–were fast disappearing in this era. But men who might have been employed in them a generation before kept the same uniform for the streets. The loss of these jobs was a major blow to the social fabric and economic situation of these communities (and certainly one of several factors, along with racism and segregation, that contributed to the explosion of gangs in Los Angeles). Also, men excluded from the labor market felt less powerful, their masculinity diminished. I don’t think I’m being original to point out that there’s probably a link between this and say, N.W.A.’s obsession with masculinity, which often manifested itself in misogynistic lyrics. It wasn’t just in places like South L.A. where economic shifts contributed to some men feeling as though their masculinity was in crisis. The disconnect between ideal and reality grew just about everywhere. For an example from a completely different kind of media, take a look at the masculinity-appealing Chevy commercials that have changed only a little in the last 20-odd years. It’s interesting to think about these commercials beamed across America to dads in easy chairs watching the Super Bowl after a long week in the cubicle. The ads’ agriculture-themed brand of manliness is irrelevant to the lives of the vast majority of Americans (fewer than 2 percent of whom work in the sector), but American men still buy the idea. Without getting into any of these details in MoJo, author Mariah Blake does a great job of alluding to the situation. In the course of her narrative, there might be a moment or two when we’re even tempted into a little bit of sympathy with Farrell in the early days of the formation of his ideology. But of course, economic changes were only part of why so many American men have felt increasingly less powerful over the last few decades. The bigger reason was that American women were finally making major strides toward throwing off the great burden of oppression, and were gaining a more equal social, political, and economic position. By the end of the article, it’s obvious to the reader that the men’s rights enthusiasts have self-servingly crossed wires on all these issues. And whatever truth there is to some of Farrell’s critiques of the organization of our economy and its relationship to masculinity is overwhelmed by the odious outcomes of the movement he spawned. Blake takes us to this place of understanding simply through good story-telling. We’re able to see the movement for what it is: organized misogyny with the sheen of intellectual justification. Well done.